When we first moved into our house, the first appliance we purchased was an electric kettle from Asda. We needed lots of hot coffee in the mornings to keep us going during the house renovations. Unfortunately our new brushed steel electric kettle from Asda had other plans for us. After only 24 hours it started malfunctioning. It kept turning itself off before reaching boiling point. It would take 7-8 times of turning it back on, before it would finally reach boiling point. Ridiculous! In summary our brand new electric kettle from Asda was a piece of junk. I would have taken it back to the shop, but the time involved, and the cost of fuel made this a counterproductive exercise. Lesson leant. That is the first and last time I will ever buy a non-food item from Asda. 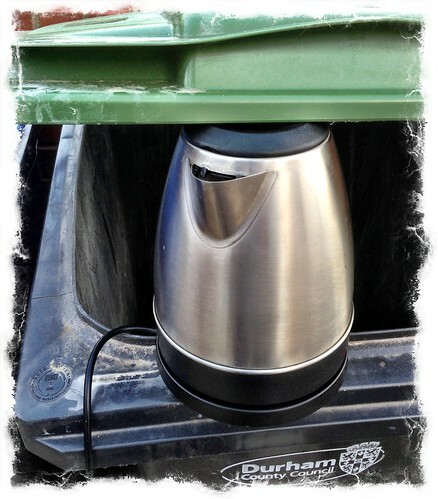 The best place for the Asda Electric Kettle ~ In the bin! This entry was posted in Kitchenwares and tagged Asda, Asda Electric Kettle, Kettle on September 23, 2013 by Richard.